A new equation combines information about a given exoplanet and the formation of life to describe the probability of life forming on an exoplanet over time. Planets Kepler-36b and Kepler-36c are depicted in this artist's illustration. 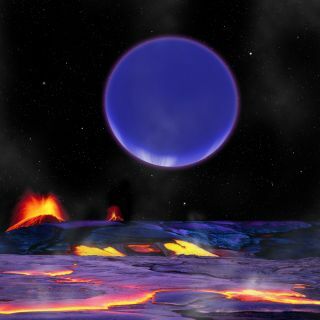 When life originates on a planet, whether Earth or a distant world, the newborn life-forms may have to overcome incredible odds to come into existence — and a new equation lays out exactly how overwhelming those odds may be. The creators of the equation hope it can connect diverse areas of research that aim to answer long-standing questions about the origins of life, much like how the famous Drake equation pulled together research concerning communications from intelligent life. The Drake equation, originally penned by astronomer Frank Drake in the 1960s, laid out a series of terms estimating how many intelligent extraterrestrial civilizations likely exist in the Milky Way. The equation takes into account factors such as the rate of star formation in the galaxy, the fraction of planets where life emerges, and the fraction of that life that gains intelligence and the capability to broadcast its presence into space. Over the years, the equation has acted as a road map for researchers searching for communications signals created by intelligent civilizations beyond Earth. Scharf and his co-author Lee Cronin, a chemist at the University of Glasgow in Scotland, hope to provide a similar road map to researchers trying to work out how — and how often — life forms on a given planet. "It came out of a moment in the field where we were trying to bring some cohesion to this study of origins of life," which is notorious for its disparate areas of focus, Scharf said. "To my mind, what this equation is trying to do, or at least trying to prompt people to think about, is how you make that connection — how do you go from some story about how life may have originated on Earth to a quantitative assessment of the probability that that happened, and what that means for life elsewhere in the universe," he said. The new equation breaks down the process of abiogenesis — the formation of life from nonliving components — into a series of simpler factors. Those factors incorporate the planet's conditions, the ingredients needed to form life and the likelihood of those ingredients getting into the right configuration for life to emerge. As with the Drake equation, each of the terms is straightforward to describe, but each hides additional complexity and room for new research. The average number of origin-of-life events for a given planet = (number of building blocks on planet) × 1/(average [mean] number of building blocks needed per "organism") × (availability of building blocks during time t) × (probability of assembly in a given time) × time. On the left, the equation considers the average (mean) expected number of origin-of-life events for a given planet. To get there, it takes into account the number of potential "building blocks" for life on the planet, the average number of building blocks needed to create a living system, the availability of those building blocks during a given time and the probability of that assembly happening during that time. On Earth, building blocks for life take the form of amino acids, lipids and certain essential metals. Somewhere else, though, an entirely different set of ingredients could create enough complexity to form life — the equation doesn't assume any specific set is necessary. "We're being kind of sneaky," Scharf said. "I think it's one of the beautiful things about it: If you write the equation this way, you don't necessarily have to worry about all the fine, fine details, but what you do do is, you start to break open the factors that you might be able to put some numbers to." For instance, if you know the size of a planet and its composition, you can begin to estimate how many potential building blocks for life there are on the planet. To calculate whether those building blocks are actually available to form life, you'd have to know more about the conditions on the planet, such as its temperature, which could render some of the blocks unusable or inaccessible. For example, these blocks could be unusable or inaccessible if they're always in gaseous form or if water is not readily available — although future research might show that life could emerge in more scenarios than scientists currently know about. In that way, the equation "links where people in exoplanetary science may actually begin to get some data, on the size of planets, the composition, and so on, to the piece that we still don't really understand but we know must have some kind of probability of happening": how it is that life first begins, Scharf said. The value Pa, which is the probability that life will assemble out of those particular building blocks over a given time, is murkier — and much more interesting. If the value of Pa is very low, it's extremely unlikely that life will form even when the ingredients are there — potentially explaining why humans haven't yet happened to create life in the lab, even if scientists have used the right ingredients, Scharf said. But a planet-wide "lab" would increase the odds that life-creating events will occur. "We might have to wait 100 million years for it to fall into place just in a test tube," Scharf said. "Whereas on a planet scale, you've got a trillion test tubes — probably even more than that. It's conceivable that, using this equation, playing these games, is hinting at a possible explanation for why we haven't seen life miraculously appearing in our laboratories, that … there's some subtle thing that has to happen that really doesn't happen often." And if the scale is larger than planetary, Scharf said, that could further increase the likelihood of life forming. Early Earth and Mars, for example, were cultivating their own, separate chemistries, but the early solar system was chaotic; impacts with other solar system bodies could have resulted in material exchanges between the two planets. That would have led to even more "test tubes" — the chemical mixing could have allowed even more interactions to occur, potentially hitting the right combination, Scharf said. If multiple planets exchange materials, it could lead to a sort of "chemical amplification [that] could, in principle, be hugely important," he said. "It could be all the difference between getting life to occur or not, especially when we're dealing with such tiny, tiny probabilities on the microscopic scale of something going right," he added. Scharf hopes that the new equation can bring together the different areas of research that relate to each of the equation's terms. For instance, the equation provides an opportunity to combine detailed examinations of far-off exoplanets, chemical research about how different molecules in different physical states can interact to generate complexity, and investigations of the smallest possible units that can exhibit living traits. Combining these areas of research, in turn, could help to link scientists' large-scale understanding of exoplanets to the microscopic chemical interactions, Scharf said. "It's not an answer; it's a new tool for trying to think about the issues involved," Ed Turner, an astronomer at Princeton University, told Space.com. Turner was not involved in the work, but the paper's definition of the left-hand probability — the expected number of origin-of-life events — draws heavily from his work to allow for incorporating scientists' uncertainty about the origins of life based on observations of life on Earth (and how much weight to give those observations). "To really put numbers on those, to think very specifically about a lot of the factors in their equation, will require a lot more knowledge about exoplanets than we have now," Turner said. "We may be decades off from being able to talk about things like the total mass of building blocks on a planet's surface and things like that." But some of the factors — especially biological ones, such as the switch from nonliving to living organisms — may not be understood anytime soon, he said. Paul Davies, an astrobiologist at Arizona State University who was not involved in the study, also said that the term that incorporates the probability of nonlife becoming life will be among the hardest to define. "We don't know the mechanism whereby nonlife turns into life, so we have no way of estimating the odds … It may be one in a trillion trillion (it's easy to imagine that), in which case, Earth life may be unique in the observable universe," Davies told Space.com in an email. "But Pa may be quite large. We simply can't say." "Setting that aside, I think the remaining terms are discussed in a very useful way as a conceptual framework for research," he added. To get a grip on that probability, humanity would have to encounter another instance of life's emergence beyond our own for comparison. Future observatories that can see exoplanets in more detail, like the James Webb Space Telescope, may be able to detect signatures from life in earlier forms than Drake might have thought we'd spot — life on the microscopic scale rather than life actively communicating with humanity. That kind of data could help illustrate what other forms life can take. The work also mentions the possibility of life arising multiple times using different building blocks — for instance, that some form of life that previously existed on Earth, or one that exists currently but is unknown to science, came into being separately from our brand of life with a totally different chemical vocabulary. Davies said that a good step toward narrowing down the likelihood would be to investigate Earth's own organisms for evidence of this possibility. "We just need one other sample of life (second genesis) and the field is transformed, because we would know Pa can't be exceedingly small," Davies said. "And that sample might be right here on Earth. Frankly, almost nobody has looked." The new work was detailed July 4 in the journal Proceedings of the National Academy of Sciences.